The F-word: Obsessively calling the Watch a "flop"
How will Samsung Pay compare to Apple Pay? Welcome to this week's edition of Non Sequitur Theater! I'm your host, the Macalope, and this week's forced attempt to put two things together that don't belong comes to us from Bloomberg's Mark Milian. Also, in another sign of bad news for the Apple Watch, people keep buying jerky. Did you know there's teriyaki jerky now? Not only that, there's teriyaki turkey jerky. Surely the Apple Watch can't compete with that. It's fun to just say it, for crying out loud. Imagine what it's like to put it into your mouth. No, that's not rhetorical. The Macalope insists you imagine it. The Apple Watch probably won't end up being the top-selling gadget that hit stores on Friday. True! Since, you know, it's not actually available for purchase in stores and may not end up being so until June. But, please, continue your Chinese acrobat level performance of logical gymnastics. Despite the enthusiasm around the big release of Apple's newest device, which is now available to try on in stores and for pre-order online, the Samsung Galaxy S6 and S6 Edge are quietly racking up huge sales, according to analyst estimates. And no one is pre-ordering the Apple Watch. It's not like it's incredibly back ordered or nothin'. Can we just stop for a second here before this cavalcade of false equivalencies continues down Goofball Lane? The Galaxy S6 is a smartphone. The smartphone market is incredibly mature. The smartwatch market, on the other hand, is barely a market. There are indications preorders of the Apple Watch were greater than all the smartwatches sold to date. 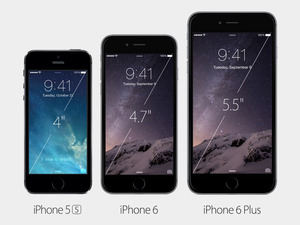 That's pretty good and a much better thing to compare it to than how many Galaxy S6's Samsung sold. Milian eventually notes the differences in the markets, but not after exerting a lot of effort to make them sound completely comparable. But you can't just slap two unrelated things together and compare them. "Ducks: At best they are a poor substitute for a two-bedroom, rent-controlled apartment in downtown Manhattan!" OK, you can, but it's totally bonkers. Because both products hit stores on the same day, the Apple Watch and Galaxy S6 are competing head-to-head for people's mind share and disposable income. Uh, no. If you're going to argue this, then everything competes against the Apple Watch -- food, collectible figurines, John Stamos and teen angst. Everything has opportunity cost, yes, thank you Friedrich von Wiesser. Most Americans won't spend their tax refunds on two expensive gadgets they don't need. The Macalope would argue that you need a smartphone a heck of a lot more than you need a smartwatch, particularly considering you have to already have an iPhone to use the first iteration of the Apple Watch. This is how dumb this comparison is: The Macalope is saying that if that's your choice -- Should I have a Samsung smartphone or an Apple smartwatch that I have nothing to connect it to? -- then, yes, get the Samsung. In reality, no one is making this choice. Still, smartwatches and smartphones aren't apples to apples. Basically, everything I've said so far is hogwash. Thank you for joining me on this journey through the dark carnival that is my soul. You can make all kinds of ridiculous comparisons to show the Apple Watch is a flop. That doesn't mean they make sense.